Our Watershed Education Program goes beyond just teaching science in the classroom. Our education coordinator, Erika Coyer, also brings innovative connections between people, topics, and experiences. This month at Oakridge High School (OHS) Erika brought native anthropology professor, David Lewis, into the classroom to talk about native lifeways in local ecosystems. He introduced topics such as plant harvest, fishing, building, and weaving materials. 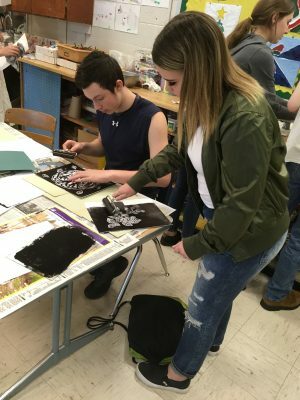 Students then utilized the concepts he shared and worked with an OHS art teacher to create imagery for a block printing project. The prints will be submitted to two events that are celebrating our local watersheds, the Honoring our Rivers publication and the McKenzie River Watershed Council’s WATERS conference. Honoring our Rivers is an annual publication that publishes river-related student artwork with the mission “to encourage stewardship of river watersheds and to nurture the next generation of civic and conservation leaders by engaging the creative capacities of our youth.” They celebrate pacific northwest rivers and the personal connection between students and their watersheds. This year the theme celebrates “the different Tribes of the Pacific Northwest and their ancestral and present-day relationship to rivers”. Previous editions and information about Honoring our Rivers can be found online at honoringourrivers.org. The McKenzie River Watershed Council’s WATERS conference is a local event that will include research presentations and a juried art competition. 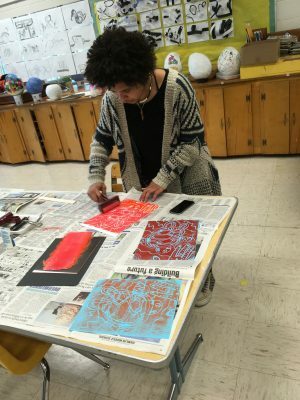 OHS students will submit their block printing projects to the competition and attend the conference. This unique opportunity will allow students to hear from other students and leaders in the field, connect with a diverse group of youth from throughout the area, and share their excitement about science. This event will take place in late May. 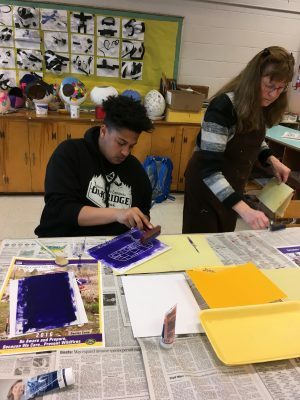 By expanding our idea of what “education” means to our local students we are able to offer these unique opportunities for students to connect with, and excel in, science programs. The Watershed Education Program allows us to offer experiences like this in schools that might not otherwise be available.